I got up at 5:00 AM and had my Donuts before getting the corrections into the trip to Cedar Rapids story. I then headed over to the Clarion for the safety meeting and I would be Bus Host for Bus 2 solo. Once we were completely full, we left Cedar Rapids for Mt Pleasant and pulled into the Midwest Old Threshers. 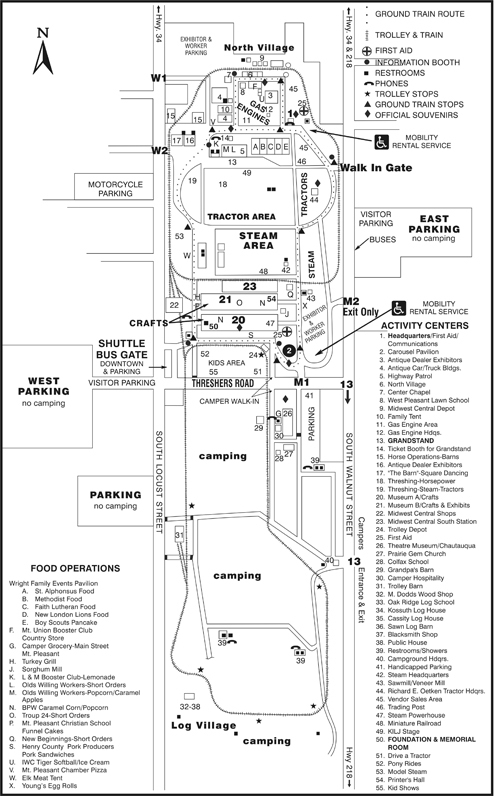 The Map of the Midwest Old Thresher Grounds in Mount Pleasant, Iowa. The operation known as Midwest Old Threshers is located in Mount Pleasant, Iowa. Mount Pleasant is a community of approximately 9,000, located in the heart of southeast Iowa. While small, every Labor Day weekend, Mount Pleasant hosts more than 100,000 visitors during the annual Old Threshers reunion. The Old Threshers Reunion dates back to 1950 and pays tribute to the agricultural heritage of the region. It includes interactive, live-action exhibition-style displays centering on restored mechanical equipment, particularly steam engines, farm tractors, stationary gas engines, antique and classic cars, the narrow-gauge Midwest Central Railroad, and electric trolleys. Besides the action, there are numerous country music shows, a huge campground, and lots of food. The Heritage Museum is open year round and features a variety of exhibits that celebrate the rural heritage of the Midwest. For the steam fan, the stationary steam engine exhibit features three large Corliss engines as well as a number of smaller engines. The Midwest Central Railroad and the Midwest Electric Railway both operate on this property. In 1959, a railroad was added to the site when a group of Midwest Old Threshers board members purchased a Davenport 0-4-0 and a depot from Hillsboro, Iowa. The following year, the organization attended the Argent Lumber Company auction in Hardeeville, South Carolina. There they acquired an 1891 2-6-0 Baldwin Locomotive, former Surry Sussex and South Hampton Railroad 6 of Virginia. They also acquired a 1906, 2-6-0 Baldwin locomotive. Numbered 2, this was former New Berlin and Winfield Railroad of Pennsylvania. The railroad also added a Model T motor car, a four man pump car, and a section car. A full circle track around McMillan Park, approximately a mile and a quarter, was built in less than 2 years. By 1966, the railroad had added a caboose and several coaches built from scratch. A water tower from the Bevier and Southern Railroad in Missouri was moved and reassembled east of the roundhouse. A small trestle bridge was built from scratch by a group of CB&Q volunteers on their evenings off. In 1966, the railroad acquired West Side Lumber Shay 9, now leased to the Georgetown Loop. In 1982, the Midwest Central Railroad obtained 16, a 1951 Henschel, built in Kassel, West Germany, that was sitting as scrap for 20 years in a Detroit rail yard. The MCRR has owned and sold various other locomotives in its history. These include an 1897 outside frame 2-8-0 engine 1,originally brought up from Mexico, and 12, a 2-6-2 Prairie engine built by Baldwin and originating in Hawaii. The Midwest Electric Railway Museum also operates on the grounds of the Midwest Old Threshers Reunion. During the event, it provides transportation on a loop around the RV campground. The loop is reportedly 1.75 miles long, with some sources saying 2.5 miles. The electric line is managed by Old Threshers, using volunteers for most of the operations. Its fleet includes several Iowa cars. This includes Car 9, a wooden combination passenger and freight car built in 1909 for the Albia Interurban Railway. This line became one of the last electric interurban lines in Iowa, the Southern Iowa Railway, which survived as a freight carrier until 1967. A second Iowa car was built in 1930 by Perley Thomas for Knoxville, Tennessee. It later became Waterloo, Cedar Falls & Northern Railway 381, and was the last streetcar to run in public service in Iowa (1958). The collection also includes Car 1100, a motorized flat car from the electric railroad that once ran on the Keokuk Dam on the Mississippi River, and former Chicago, Aurora & Elgin 320, a wooden interurban coach was built in 1914 by the Jewett Car Company. Filling out the collection are two open-bench cars built in 1911 in Rio de Janeiro, Brazil, a 1927 "Peter Witt" type car from Milan, Italy, and former MBTA line car 3279. I started my visit by looking at the railroad shop. One of the track cars on the railroad. An engine being worked on in the shops. I then went outside. Engine 14 and the shop building. Outside the car shop was a freight train. CM & ST. P Caboose 55. Our steam train to ride and photograph today has steam engine Surry, Sussex & South Hampton Railway 2-6-0 6. I will now set up for my first runby along the west side of the loop. My first runby along the north fence of the steam loop. I moved to my next photo location. Next the train came to a stop and did a blow down at the northwest corner of the grounds. Here Keith Schmidt joined me and would photograph with me until we would ride the train. Now the train started up and run by us at the northwest corner of the grounds. From here we walked to the northeast corner of the loop for my next runby. My runby at the northeast corner of the grounds. We move over to the little trestle for my next set of pictures. The train crossed the little trestle. We next moved along the east side of the loop. The train along the south side of the loop. We then moved to the southeast corner of the loop. The semaphore signals changed before our eyes. The train at the southeast corner of the ground. We walked over to ride the train but one more picture before we do. The White Pass Caboose in the car barn. Next we took a ride on this steam train so enjoy these views. You have now made the loop with me around the steam loop on the Midwest Central Railroad. Now I would set up for a few more runbys. Here is two views of our engine at the Midwest South Station. The engine and train ready for another trip. I moved to the southwest corner of the loop. These two pieces of equipment came out onto the loop. The train at the southwest corner of the loop. I moved to my final runby on the steam loop location. Another set of views of those two pieces of railroad equipment. The train came through the "S" curve. The engine blew down like it did on every trip today. The engine started up and went by my location. The engine gave me a great show this morning.